No visit to Sydney is complete without taking in the Sydney Harbour Bridge. This amazingly beautiful structure can be climbed, gone under, flown over, walked across or simply looked at and photographed. It makes an impressive background to the sights in the harbour and is a spectacular vision to behold. A Sydney Harbour dinner cruise or one in the morning or at lunch time for that matter takes you around the harbour in style. See all the sights and sounds of this bustling port on commentated trips complete with fine dining and entertainment. Mrs. Macquaries Chair at the Royal Botanic Gardens lets you see the beautiful views of the harbour, the Opera House and the Bridge from a gorgeous garden setting. Come early for this treat, it’s popular with everyone. Tour the Palm Beach Lighthouse, sure to impress and inspire. Take in the open air cinema, movies under the stars and the backdrop of the Harbour. What could be better? What things to do in Sydney list would be complete without seaplanes? Take a tour of the whole area and see it all from high above, even fly past the Bridge and wave to the climbers! Take a large, three wheeled trike for a spin on the Northern beaches. A great and unique way to see the sights and have some fun at the same time. Take a half day tour from Sydney to see Bondi beach. Take your swimsuit or learn to surf. Families looking for things to do in Sydney will love the zoo. Lots of animals, lots of fun, what more can you ask for? Tour the Australian Wildlife Park where you will see koala, kangaroos, and other wildlife true to the region, and see the famous Blue Mountains on the way. 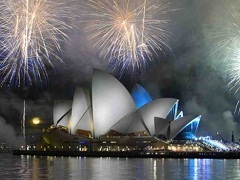 Many Australian cruises stop in Sydney, or perhaps you want to explore the city after your cruise for a few days. Sydney offers something for everyone and is one of the busiest and most renowned of the Australian ports. With its rich history, instant recognisability and gorgeous landscapes, things to do in Sydney will be fun and educational for the whole family. Enjoy!